Singapore, 12 January 2018 – M&L Hospitality, the Singapore-based hotel investment platform, today celebrated the opening of its newest premium independent hotel in Sydney, West Hotel. 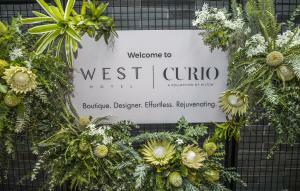 The hotel was officially opened by the Minister for Tourism, the Honourable Adam Marshall, Mark Nogal, Global Head – Curio Collection by Hilton and hotel owner and Executive Director of M&L Hospitality Mr Michael Kum. The new hotel, named after its location on the Western Corridor of Sydney’s CBD, is only the second new hotel to be built in Sydney’s CBD for approximately 17 years. 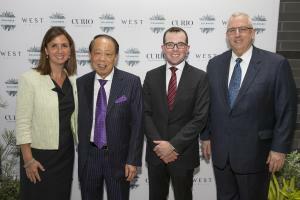 The opening of West Hotel, marks M&L Hospitality’s third property in Sydney and sixth in Australia. The 182 guest room hotel is located on Sussex Street, close to the new Barangaroo commercial and leisure precinct as well as the popular Darling Harbour waterfront. The hotel joins M&L Hospitality’s established Sydney properties; the Swissotel and the Hyatt Regency Sydney, Australia’s largest hotel. “M&L Hospitality are delighted to officially open the West Hotel. It has been a pleasure to work with Hilton and Multiplex and we are very excited to bring this new designer boutique hotel to Sydney’s CBD. The opening of another hotel in Sydney is testament to our confidence and commitment in Sydney’s Hotel sector” commented Neil Maxwell, Chief Executive Officer of M&L Hospitality. Architecturally designed by Fitzpatrick and Partners, with interiors by Woods Bagot, the West Hotel’s distinctive character offers a reassuring taste of splendour in Sydney’s newest cultural hub and appeals to curious corporate travellers seeking an authentic Sydney experience. Modern classic design elements have been skilfully crafted throughout the interiors, curating a palette that reflects the character of Sydney Harbour and its natural surrounds, complemented with rich, textured hues. Bespoke artworks, graphic floors, sculptural lighting and natural stones are some of the design features that pair edgy industrial detailing with polished sophistication. Each of the 182 bedrooms include state of the art in-room entertainment systems and practical work areas for the busy corporate traveller. The West hotel is well suited for mixing business and pleasure as it includes four suites, an elegant restaurant and bar, a fully equipped gym and a private meeting room. 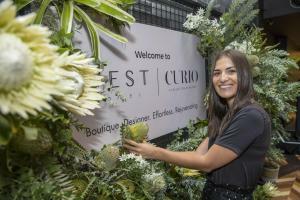 “Corporate and leisure travellers are demanding a distinctly different hotel stay, with many opting for a boutique, personalised and well-located hotel experience. 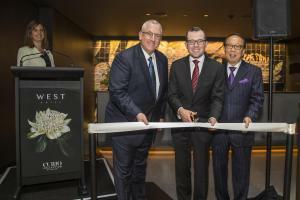 West Hotel’s prime position close to Barangaroo and strong design elements will provide these travellers with a truly new and unique hotel experience in this dynamic Sydney CBD location,” Neil Maxwell, Chief Executive Officer of M&L Hospitality continued. The Solander restaurant offers a relaxed and sophisticated dining experience. Situated on the ground floor of the West Hotel, the 70 seat modern Australian all-day dining restaurant showcases locally sourced, fresh seasonal produce and Australian botanicals to create inspired dishes. 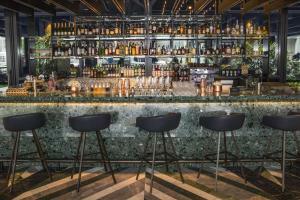 Embodying the spirit of Australia, the Solander Bar offers bespoke botanical inspired cocktails that can be enjoyed at the stunning emerald green terrazzo marble bar or in the open-air Garden Atrium surrounded by lush green foliage. The opening of the West Hotel brings M&L Hospitality’s global portfolio to 15 hotels across 7 countries.